Pendelfin was born in 1953, in the shadow of the Pendle "Witch" hill near Burnley in Lancashire, in the north of England. It started out as little more than a hobby for Jean Walmsley Heap (J.W.H.) and Jeannie Todd, working from a wooden hut in Jeannie's back garden. But this hobby soon became an obsession and a successful business as the Pendelfin family grew and grew. The very first PenDelfin piece was modelled on the Pendle Witch and took the form of a moulded wall plaque. Very early on in the Pendelfin journey, J.W.H. and Jeannie realised that their roles should be different, and so as they took their first experimental steps towards success, J.W.H. took on the design and modelling of the stoneware figures and Jeannie began to master the art of mould-making and casting. Following on from the Pendle Witch, The Fairy Shop, a large 3-dimensional wall plaque, was modelled, based on an original painting by J.W.H. and (ab)using an antique mirror to produce the mould of the frame. At this point, with mould-making sessions and materials growing, the shed was becoming far too small and PenDelfin was relocated to the village of Harle Syke and into a small lock-up shop. During PenDelfin's time at the shop, witches continued to be a popular theme, with more witch-based models being produced, including the Cauldron Witch, the Pixie House and on a completely different theme, the famous little Thrifty, modelled at the request of J.W.H. 's part-time employers, the Burnley Building Society. Little Thrifty began life in the Children's corner of the Burnley Building Society. Created by J.W.H. he was involved in many stories encouraging children to start putting their pennies away. One large model of him was created, but making it proved such an ordeal that no further models of his size were ever attempted. Interest began to grow in the figures being created, and around 1954 Doreen Noel Roberts joined, eventually taking charge of the group of small part-time staff working there. The size of both staff and operations began to increase, as sales gradually improved. In 1956 a small family of rabbits were produced for the first time. This became a turning point for PenDelfin as these figures started to sell very well indeed. Repeat orders started to pour in, and attention started to focus almost exclusively on producing PenDelfin's trademark rabbit models, all with a carefully thought out character and history! 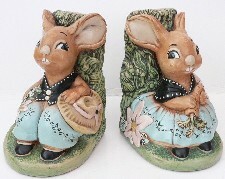 A band of musically inclined rabbits, rabbit bookends, uncles, aunts and of course the original Father and Mother rabbits all followed, as well as many other lively young characters and several large and lovingly modelled stands to provide a backdrop to the PenDelfin village, as it became. PenDelfin continued to expand, and although it had its trials and tribulations, by the 1970s was a well established company in Burnley, occupying a large part of a former mill building and dispatching members of the PenDelfin family to enthusiastic collectors all over the world. On the 11th June, 1986, disaster struck as a devastating fire destroyed most of the PenDelfin works. Almost miraculously, and thanks to amazing efforts by all the staff, lead by Arthur Morley, production was underway again in less than a week. In 1992 the PenDelfin Collectors Club was founded, with "Family Circle" pieces produced each year for club members only. PenDelfin is still in business today, but is perhaps not the company it once was. Ownership of the PenDelfin company has changed, and the models are made in China now. Time will tell whether the legend of PenDelfin endures, but in the meantime the older pieces are now becoming ever more scarce and collectable, with rarities such as Aunt Agatha and the Rabbit bookends commanding strong prices as collectors seek out the early pieces to complete their collections. We'd recommend these books if you are interested in finding out more about Pendelfin. These book links will take you to Amazon. If you make a purchase we will receive a small referral fee.